Only her enemy can set her mind free! When Micah's incarceration brings him face to face with the head of the Union itself, he discovers a devastating weakness in the Union's stranglehold on the star system...and a shocking truth about his people. Now a fugitive from the Union she so loyally served, Treska is forced into uneasy alliance with the Restoration. As the lies holding the Union together at the top begin to unravel, so do the thin threads maintaining Treska’s false identity. With her world shattered and her identity in crisis, Treska’s only ally is the man whose mental powers terrify her. It’s going to take all of Micah’s mental talents to set her free, but her fear of his gifts may make Treska a prisoner of her own mind. Ever since she was found in the aftermath of alien attacks, Treska Sivekka has been trained to one purpose--to hunt down threats to the security of the Union that gave her an identity. But when the Union's biggest threat inspires desire, and not fear, it’s going to take all her training to protect her principles against his persuasive onslaught. 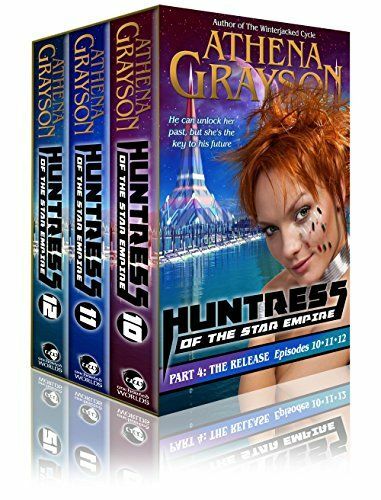 The Huntress's neuro-collar and repulsor cuffs may keep Micah bound to her mercy, but they can't stop him from challenging her convictions, and the lies she's been told about his people. But when the secrets surrounding her own missing memories begin to reveal themselves, he may be the only one she can trust.